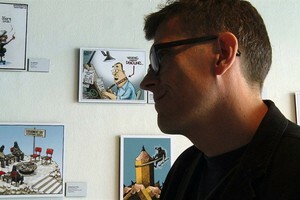 A political cartoonist known for his subversive and often controversial art, Mr. Fish’s work can be seen in publications such as Harper’s, The Nation, The Los Angeles Times, LA Weekly and The Village Voice and sites like truthdig.com. In this intimate and revealing documentary, we are introduced to the dangerously funny cartoonist as he struggles to stay true to his creativity in a world where biting satiric humor has an ever-diminishing commercial value. A brilliantly insightful and timely documentary, CARTOONING FROM THE DEEP END is about the kinds of compromises a radical artist makes (or refuses to make) while trying to live in a traditional society. "It is everything I live for in an art documentary... a truly fearless artist."